Pallet jacks are not all the same. Many are just not built to handle the loads and hold up under rigorous use. 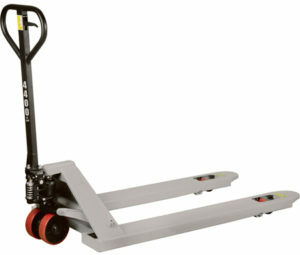 What you want is a pallet truck that is a workhorse and that can hold its’ own. Heavy lifting capability up to 4400 lb is a must. You need a pallet jack that is versatile, for use in the warehouse, manufacturing applications, retail settings and many other environments. You need a pallet jack that is engineered for performance, with smooth running wheels and abrasion resistant wheels, with substantial, reinforced heavy-gauge forks, with easy entry forks, versatile working lift range up to 7-1/2 inches, and with a tight turning radius. And it helps if your pallet jack is rugged in every respect. Rugged design, incredible engineering, excellent craftsmanship, and great looking with a corrosion resistant powder coating. You need that quality right down to the dependable handle pump and leak resistant hydraulics. If you are looking for a dependable pallet jack or pallet truck, we can help you find the right one for your application – or one that is versatile for many uses. We can also help you if you are looking for any of these types of items: hand pallet truck, pallet lifter, pallet jack for sale, pallet mover, pallet lift, hydraulic hand pallet truck, pallet jack capacity, pallet truck for sale.